Food Waste Recovery: Processing Technologies and Industrial Techniques acts as a guide to recover valuable components of food by-products and recycle them inside the food chain, in an economic and sustainable way. The book investigates all the relevant recovery issues and compares different techniques to help you advance your research and develop new applications. Strong coverage of the different technologies is included, while keeping a balance between the characteristics of current conventional and emerging technologies. This is an essential reference for research outcomes. "There is no doubt that with rising populations, food wastage is of ever growing significance. We are now at a point that it is no longer sufficient to simply reduce the amount of industrial or supply chain waste, whether agricultural or processing by-product, but to eliminate it. To achieve such targets, the inherent value; nutritional or functional, must be recovered from any waste stream. This requires a deep knowledge of the potential of such waste material, which in turn can drive the innovation process to realise that value. Food Waste Recovery edited by Dr. Charis Galankis provides the detailed insight needed to address these challenges head on. 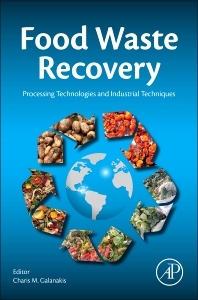 With detailed reviews of food wastage sources, potential value of waste streams and the traditional, innovative and emerging extraction and recovery technology, this book achieves the editors vision of producing an essential reference tool for food and drink professionals tackling the increasingly important issue of food waste." --Steve Osborn B.Sc. (hons), M.Phil., C.SCI., FIFST, Principal consultant - Food and Beverage, The Aurora Ceres Partnership Ltd.
"Food Waste Recovery edited by Dr. Charis Galanakis, does not just cover the issues of sustainability, valorisation and waste recovery in modern food processing, but also discusses extensively the issues of land and water use. Chapter 2 provides an excellent and comprehensive summary of the different types of waste derived from both plant and animal origin. Pre-treatments of food waste, conventional processing methods to extract materials of interest as well as new/updated methods are given a good synopsis in Chapters 4 and 5. I can also thoroughly recommend the good analysis of more recent extraction techniques discussed in Chapter 6 and Section III, which, although not unique, are interesting reminders of the challenges faced in the context of food waste. Overall, this is an excellent book, dealing with the aftermath of today’s heavily industrialized food production and processing, and provides a good overview of the ways to reduce and control the resultant inherent wastage." --Muyiwa Akintoye, PhD, Research & Development, Quorn Foods Ltd.